Analyzing the famous academic aphorism "publish or perish" through a modern digital lens, a group of emerging ecologists and conservation scientists wanted to see whether communicating their new research discoveries through social media–primarily Twitter–eventually leads to higher citations years down the road. Turns out, the tweets are worth the time investment. "There's a compelling signal that citation rates are positively associated with science communication through social media. Certainly, Twitter provides an accessible and efficient platform for scientists to do a majority of that communication," said Clayton Lamb, a University of Alberta PhD student and lead researcher on a new study out today. "The good papers that get pushed on social media are what end up on people's minds and eventually as PDFs in their reference manager," he said. As is common among scientists, what started as a personal curiosity turned into a full-scale study. Along with Sophie Gilbert, a former U of A post-doc now working in the Department of Fish and Wildlife Sciences at the University of Idaho, and Adam Ford, an assistant professor at UBC (Okanagan), Lamb explored the phenomenon of science communication in the social media age, measuring the association of altmetrics–alternative impact factors, which consider, amongst other avenues, social media attention surrounding science discoveries–with eventual citation of 8,300 ecology and conservation papers published between 2005 and 2015. The three scientists, who use Twitter to communicate daily about their science (see @ClaytonTLamb, @SophieLGilbert, and @adamthomasford), found a positive correlation between social media engagement and traditional measures of scholarly activity. "There's a big hype when a paper comes out, but then there is this underwhelming lull for a year or two as you wait for citations to accumulate, so you don't really know whether your science is reaching people. 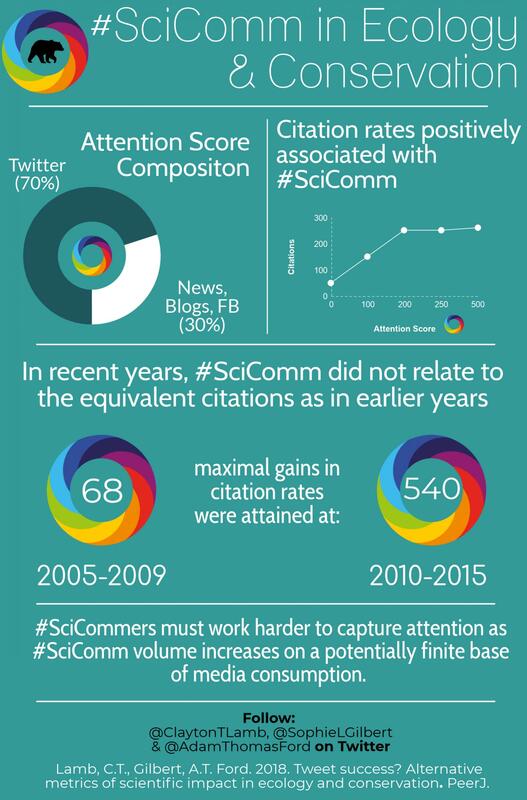 We quantified whether science communication may correlate with more citations. In the case of ecology and conservation science, it looks like it does," said Lamb, who is completing his PhD tracking grizzly bear population patterns with supervisors Stan Boutin in the Faculty of Science and Scott Nielsen in the Faculty of Agricultural, Life, & Environmental Sciences. Science communication is viewed as critical to ecology and conservation, where research findings are often used to shape public policy and mainstream media attention. Lamb said though much of scientists' communication on social media is directed at other scientists, by virtue of the medium, information is making its way to the broader community, noting statistics showing that nearly half of ecologists' followers on Twitter are non-scientists, environmental groups and the media. "Ecologists and conservation scientists are dealing with applied problems that the public cares a lot about. So when science gets stuck in the circles of academia and doesn't make it out to the public, it's doing that publicly funded research and its potential applications, a disservice," said Lamb. "In this era of alternative facts and some mixed messaging surrounding science, data-driven scientific information offers a light of truth. Twitter is one of the ways we can help share science with policy-makers, other scientists and the public." "Tweet success? Scientific communication correlates with increased citations in Ecology and Conservation" appears in the April 12 issue of PeerJ, a peer-reviewed scientific journal.